This blog has been set up for the friends and family of Al Groves. The purpose is to provide information, updates, and prayer focus for Al, Libbie, and their family. During a time like this, there are so many wonderful people who are concerned and want to express their love for Al that it is difficult to keep in close, updated contact with everyone. This blog will provide a place for friends and family to come and find updates (so they don’t have to keep asking Al or Libbie “what’s the latest news?”) and also a place for Al and Libbie to express their own thoughts as they have time. If you are coming to this site for the first time, be sure to read Al’s post which gives an overview of his diagnosis in February 2006. You can find it by clicking here. 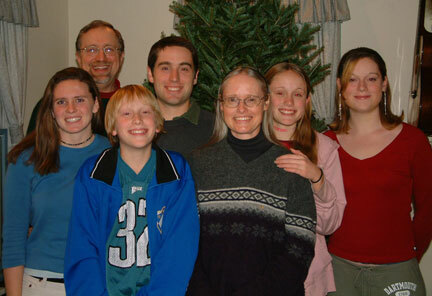 Christmas 2005: Al & Libbie with (Left to right) Lauren (daughter-in-law, 23), Alden (12), Alasdair (23), Eowyn (15), and Rebeckah (21). Return to the Blog Updates here.